LincEnglish, a Japanese-based online English teaching centre had previously announced a planned collaboration of "Megurine Luka & Hatsune Miku x LincEnglish" with Vocaloid-related teaching materials, which was scheduled to start on April 1st. However, a slight misinformation had occurred when the classes started. Those whom enrolled had expected Vocaloid-related teaching materials, complete with textbooks and exercises revolving around the Vocaloid universe, complete with its characters and illustrations. According to the website later on, it was revealed that the normal teaching materials could not use the illustrations as shown on the website, but promises an original novelty present upon registration for their classes. Hopes of having Luka-nee or Miku-nee teaching eager fans have been dashed, as it was purely a marketing strategy, none of it related to the educational means for those who've enrolled. 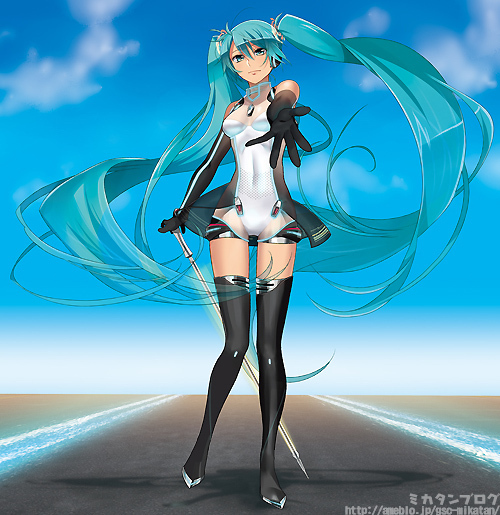 However, a notable and favourite illustrator of mine handled the main banner, Murakami Yuichi (村上ゆいち), the man whom is also responsible for the visual key of Racing Miku 2011, which has ended up with Nendoroid, figma and currently a 1/8 scaled renditions.